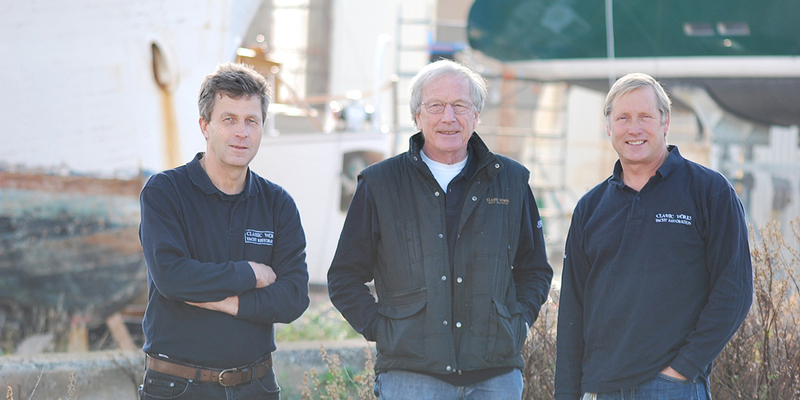 Our bilingual, experienced and professional team of local shipwrights, joiners and craftsmen is headed up by Erik Wirta, Butch Dalrymple-Smith and Alex Laird. After learning to sail at his childhood home on the Isle of Wight, England, Alex, aged 19, found the hull of Partridge in 1979. He spent the next 18 years, on and off, restoring the yacht and carried out most of the tasks with his own hands. At the beginning of Partridge’s restoration, Alex undertook a shipwright’s apprenticeship with Fairey Marine in East Cowes. He obtained woodworking qualifications on a full time boatbuilding course and in the mid 1980’s, still sponsored by Fairey Marine, he gained a Diploma in Yacht and Boat Design from The Southampton Institute. Prior to founding CLASSIC WORKS in 2003 with Butch Dalrymple-Smith, Alex was project manager on the restoration of the classic sailing yachts Royono and Orion in the La Ciotat shipyard, working closely with Butch and a large team of craftsmen. Alex has been the captain of Partridge since her re-launch in 1998. He now keeps an eye on Partridge throughout the year as she is berthed in the old port of La Ciotat and the team at CLASSIC WORKS look after her. After leaving university, Butch spent 12 years racing sailing yachts and doing enough boat-building, rigging and sail-making to sustain his passion. In 1973/4 he competed in the first Whitbread Round the World Race (now the Volvo Ocean Race) on the Swan 65 Sayula and this circumnavigation brought his total number of sea miles to over 80,000. Following Sayula’s victory, he began a seventeen year association with Ron Holland in Ireland, where they worked together on over 200 designs including such iconic yachts as Kialoa, Condor and Whirlwind. To broaden his horizons he subsequently moved to Germany and worked in the design office of the well-known superyacht builder Lürssen. A period as chief designer at Camper & Nicholson’s Yachts followed before the pleasures of living in the South of France drew him to La Ciotat where he set up his design and engineering office in 1998. In 2003, he started CLASSIC WORKS with his sailing friend Alex Laird. Erik came aboard CLASSIC WORKS in 2008 as a project manager before joining founders Alex and Butch as Managing Director in September 2011. Erik compliments Butch’s technical expertise and Alex’s keen eye for craftsmanship with over twenty years of international management experience. Erik was born in Connecticut, USA, in the heart of the New England shipbuilding corridor that stretches from Boston Massachusetts to Bath, Maine. At the age of nine, he discovered sailing as a family sport while in England on the Solent, and at the sailing school of the Island Cruising Club, in Salcombe, Devon. Since then he has never missed a chance to put to sea, either to race, to cruise, or to cross an ocean. Erik is a graduate of the American College of Switzerland in VD, and holds an MBA from the Thunderbird School of Global Management in Glendale, Arizona, USA. Contact us to request more information and to learn more about our quality Yacht Refit and Restoration services.